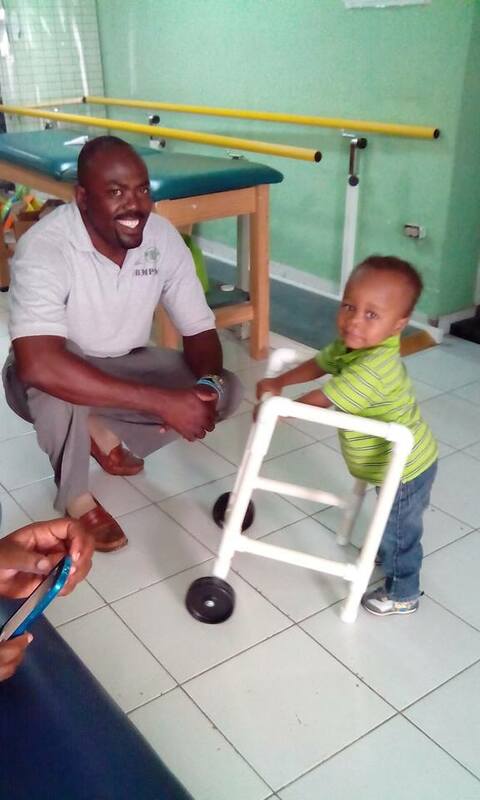 Finding a job in Haiti in difficult enough, finding one if you have a disability is almost impossible. 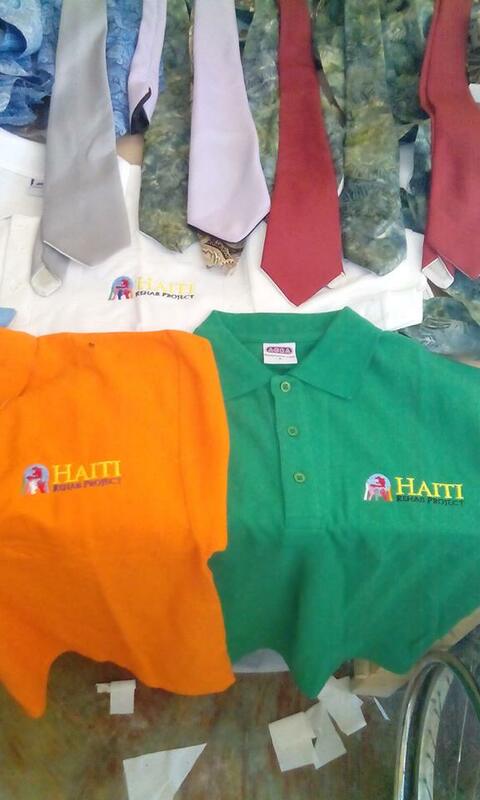 In late 2013, we opened our shop in Port-Au-Prince, Haiti. At our shop, we provide a space for those with physical disabilities to meet, plan and work. 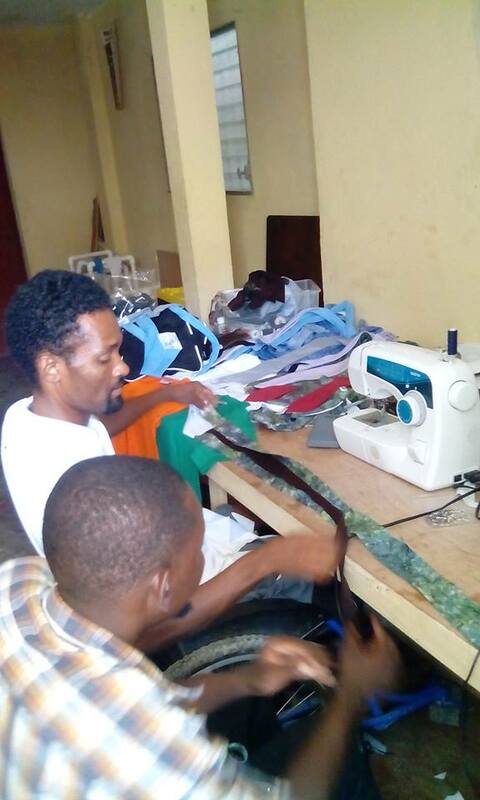 Here they have the opportunity to support themselves and their families in a country where finding employment is difficult and even more difficult for those with disabilities. 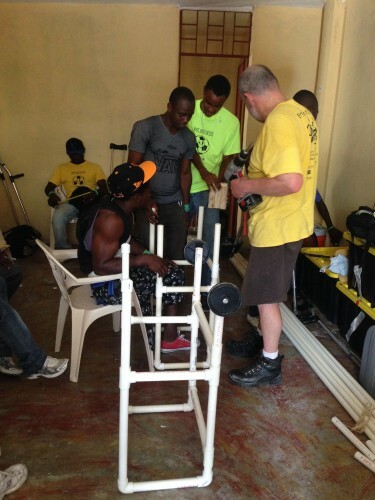 We have trained eight men with lower and upper extremity amputations to make canes and walkers and other items out of PVC pipe. 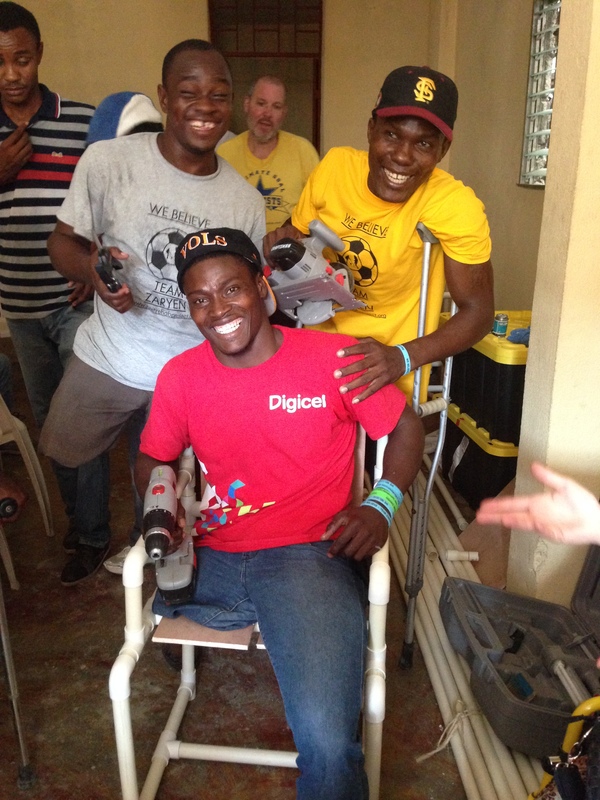 The shop is where we run our Mobility Devices for Haiti program. 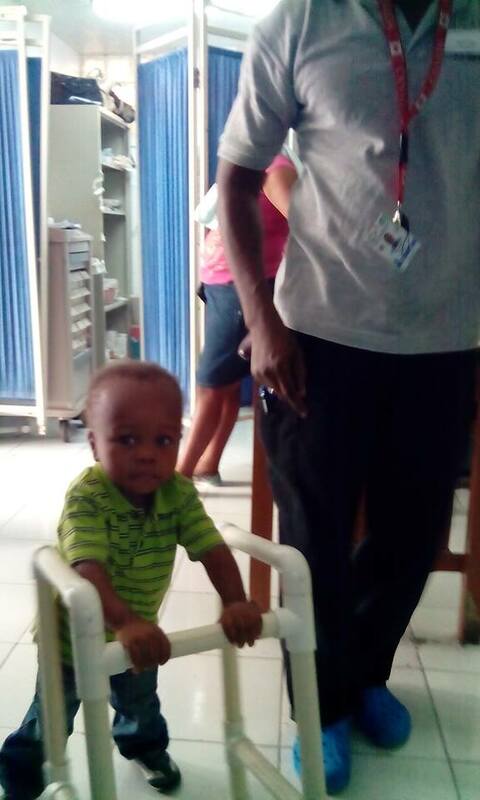 These craftsmen are now able to make, fit and train others in the proper use of the mobility devices they issue. By teaching the concepts of working with PVC , the players experienced how virtually anything could be made from this versatile material. They are able to make shelves, tables, chairs and more from PVC in addition to mobility devices. 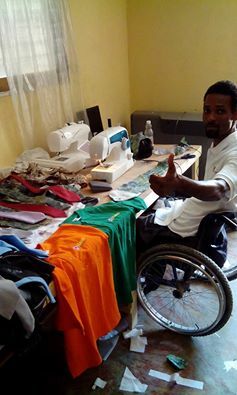 In our shop, we also support other craftsmen with physical disabilities to run a sewing and embroidery business. One man is currently mentoring another to become proficient with sewing and embroidery and we will continue to expand this program. We are currently accepting contracts for sewing and embroidery work. This past January, we continued our training programs to include basic woodworking. 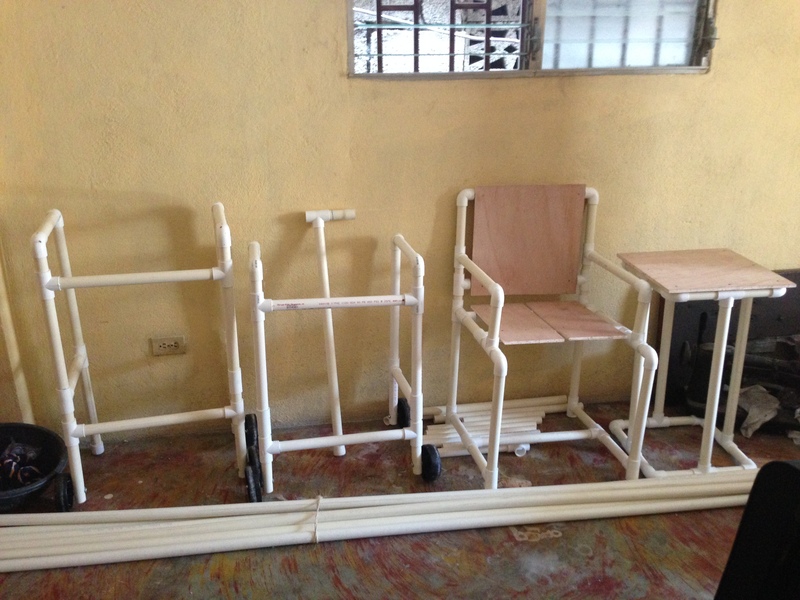 Through this program, we made mat tables and steps for the rehabilitation clinic we hope to open with the next year. Staff were trained in the use of basic tools, equipment, sanding and staining. 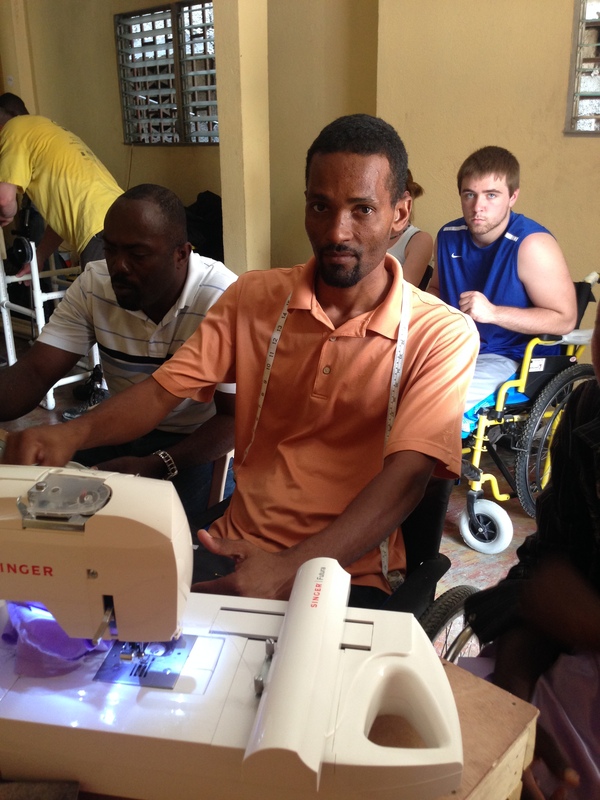 We are planning on continuing with educational programs to expand their skills with the woodworking and sewing programs to increase opportunities for employment for those with disabilities in Haiti. Please go to our donate page to support our Shop in Port-au-Prince. See below to follow our progress in the shop! Industrial Sewing machine shipped to Haiti. Now Cator can finish the cuff weights for the rehab clinic and possible start making sandals to sell in Haiti. 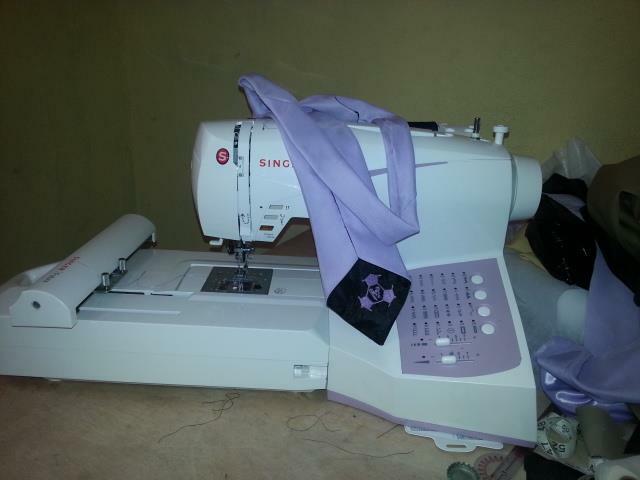 Thanks so much to our donors who helped cover the cost of the sewing machine! 50 embroidery needles, 20 standard sewing needles and 20 yards of material shipped to Haiti this month! They can buy solid colored material locally but wanted some cool prints, plaids, and paisley. Wait until you see how they turn out! The Haiti Rehab Project logo is working now as well. What should we make? Please send any ideas or requests to info@haitirehabproject.org. We need all the suggestions we can get! 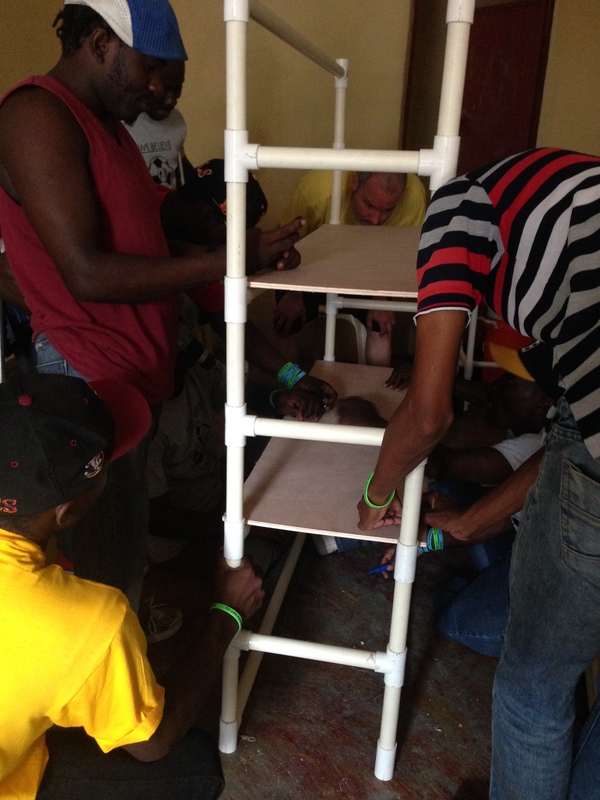 The team gets to work and makes pediatric walkers with PVC pipe. Check out this little guy and try not to smile. The embroidery business is the getting of the ground as well. Some more samples and team shirts look great! Haiti Rehab Project team arrives at the shop. 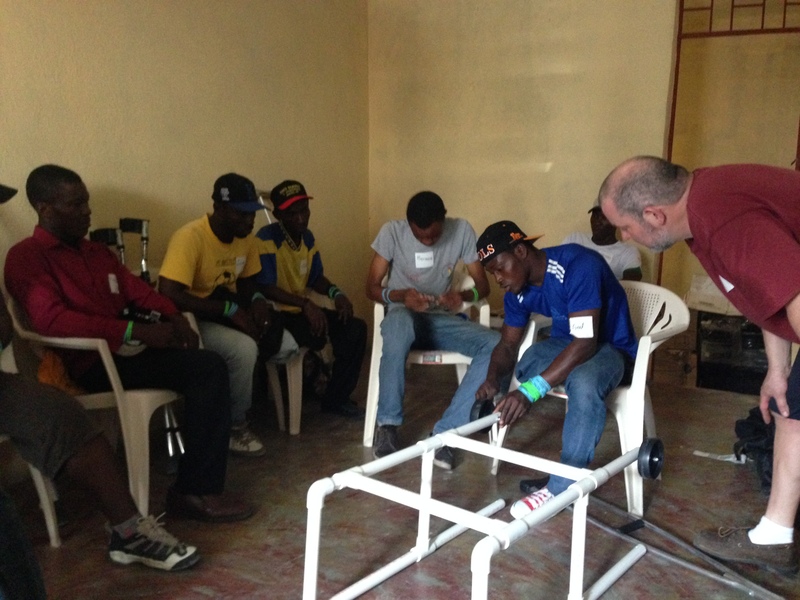 Eight highly motivated Team Zaryen players participate in a training program to learn how to work with PVC pipe. What a blast they had learning to make walkers, canes, chairs, tables and shelves out of PVC pipe. Endless thanks to John Peters for bringing his skills, expertise and sense of humor to the shop! Also, this week, this week, Cator embroiders and sells the first Team Zaryen tie! Check it out! 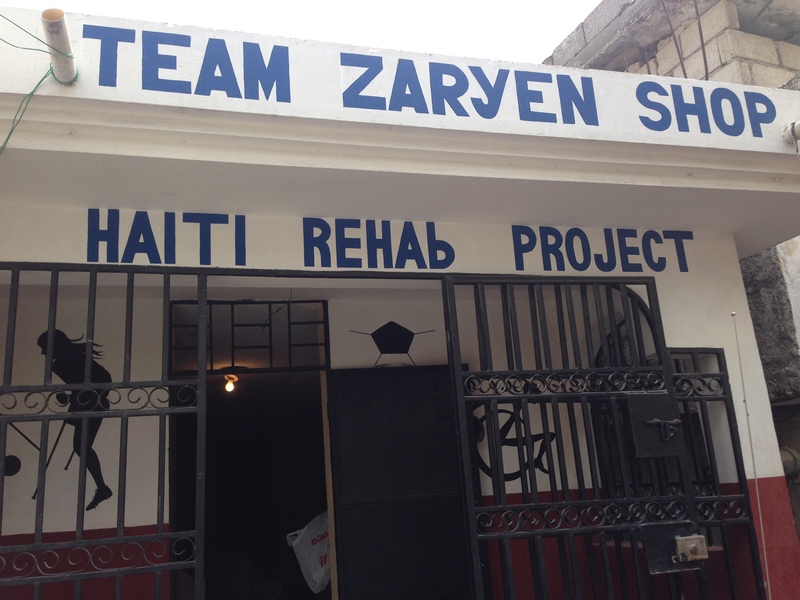 With our support Team Zaryen has rented space for a shop in Port-Au-Prince. We are working on buying the start up supplies and equipment and are hoping to begin in January.